An extraordinary and utterly emotionally novel, Christina Lauren’s Autoboyography is a completely new reading experience in the realm of LGBTQ+ young adult literature. A coming of age self discovery story, Lauren’s novel follows Tanner’s journey as a bisexual teen surrounded by a community that may not completely accept his sexual identity. But then there’s Sebastian, a recently graduated Mormon who devours his attention — and the feelings are more than mutual. A complex story about love and acceptance, Lauren’s Autoboyography is absolutely impossible to put down. Within the first few lines of this novel, I knew Autoboyography had captured my heart in every way possible. There’s depth … and then there’s this rawness and realness that so many of us are scared to tread down. Christina and Lauren’s writing (yes…the author is the combination of two people via their first names) styles are captivating, drawing such strong emotions that it’s hard to not become engulfed by them — it’s almost unfair how brilliant their writing skills are. Oh yes, friends — I found another author (or rather, authors) to read more of in 2019. CONTENT & TRIGGER WARNING: This book contains homophobia, emotional abuse, depression, disowning, guilt, and controversial topics regarding atheism and religion. Christina and Lauren are not afraid to discuss more sensitive topics, the kinds of subject matter that society prefers to suppress rather than talk about. There’s a huge emphasis on the concept of faith and acceptance within the LGBTQ+ community throughout the novel, exploring the struggles from both an inside and outside perspective through Tanner and Sebastian. While Tanner is comfortable with his sexual identity, Sebastian’s constant conflict between what FEELS right versus what’s been SAID as right are an ongoing wedge between the two. Using their own personal experiences working with others who have gone through similar circumstances as Sebastian, Christina and Lauren bring on another level of complexity yet realness to their work. The authors are very tactful when discussing religion and the LGBTQ+ community; their novel shows that even though some within certain religious groups feel rather strong about sexual identity, not all within this community are a party to it. Even through the darker moments, they’re still show the elements of beauty that can be found in faith. The emotions and thoughts through Tanner’s eyes are SO real, borderline unbearable but such a breath of fresh air.Many young adult books are beginning to divulge into topics such as physical attraction and desires, but Autoboyograpyhy brings this to a whole new level. Tanner’s desires to touch and be close to Sebastian are passionate yet tasteful, brilliantly exemplifying what it feels like to be a hormonal teenager falling in love. Readers are invited into Tanner’s most inner deep thoughts, the “good and juicy” stuff that we are told to feel ashamed of when we think these things — and yet, there’s no reason to. From arousal to his humorous moments of “trying to listen to Sebastian but distracted by thoughts of doing a number of unmentionables to him”, this in-depth first person narrative provides both comical relief and a sense of normality in a world so driven to tell us we are wicked for feeling these sensations and thirsts. The central characters are extremely complex and in-depth — it truly doesn’t get much better than this! Tanner isn’t the only well-rounded character for readers to enjoy, for Christina and Lauren FILL this novel with exciting characters with vibrant personalities and intriguing stories — Sebastian’s sexual identity and his devotion to God; Tanner and Autumn’s connection and friendship; Tanner’s parents’ emotional backstory and current external family struggles — there’s PLENTY of interesting and beautiful subplots for readers to enjoy. Character oriented reader? Look no further, for Autoboyography is THE PERFECT choice for you! Perfectly paced and wonderfully detailed, Autoboyography grasps the audience with its plot through these flawless elements. Christina and Lauren’s novel not only contains beautifully detailed characters and a wonderfully written plot — they also achieved perfection in the art of PACING!! Tanner and Sebastian’s enticing connection and personal battles take place over a period of months to almost a year, not rushing the events that occur throughout the narrative. In addition, that feeling of “insta-love” doesn’t feel as annoying as I originally predicated, for the authors craft Tanner and Sebastian’s attraction for one another carefully. Rather than insta-love, Autoboyography navigates from instant magnetism to instant liking and curiosity to eventually…a wonderfully paced love story. Honestly, how could I give this novel any woes?? Autoboyography left me completely vulnerable in the most beautiful way imaginable. The struggles Tanner and Sebastian face are heart-wrenching, but their perseverance to discover who they are and how they fit in the world is remarkable and admirable. It’s been such a long time since a book has made me experience this feeling of serenity and tranquility — this has been one of the hardest reviews I’ve ever written, for I completely loss my ability to produce thoughts into words as my emotions took over. 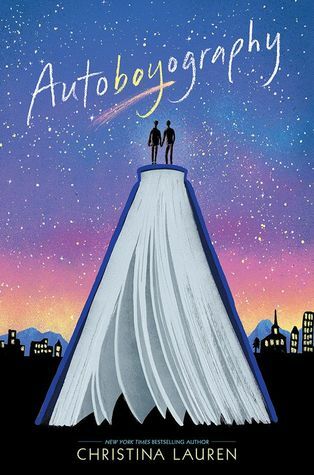 If you’re looking for that novel that dares to face difficult topics head-on, that story that leaves you completely intoxicated in the realness of life, that story that emphasizes the importance of acceptance and love … then pick yourself up a copy of Autoboyography — you won’t regret it. All those amazing things are true ❤ It's such a beautiful story, but it does pull on those heart strings — I had to take breaks before my emotions went out of whack ha-ha! I really can't wait for you to read it! Let me know your thoughts when you do! I’ve heard great things about this book, but your review has catapulted it to the top of my next TBR. Great review. Thank you! Aweeeeeeeeeeeee!!! Thank you! I’m so glad! It’s a really remarkable read. It definitely was challenging emotionally at first, but it was so worth it. I really can’t wait to know what you think of it! I have this one on my TBR, I can’t wait to read it. Glad to see a positive review on it. Thank you very much — I’m glad my review helped in some way! It’s a beautiful story, but definitely be forewarned that it’s an emotional rollercoaster ride lol. I’ve heard nothing but amazing things about this book and it keeps on showing up on Good reads and on other people’s blogs. Maybe it’s the world telling me to add it to my TBR! Great review!! I think it is, my friend *sending read this book vibes*. You really should; it’s beautifully written and VERY blunt about the topic at hand, which I think is fantastic. Thank you again! I really appreciate the feedback! If it’s fate, then it must be done! I’ve officially added it to my TBR! YAY!!! I can’t wait to know what you think!